Coca-Cola says it is a company that supports transparency and consumer empowerment. But it has spent millions of dollars to fight against mandatory labeling of genetically engineered foods in California, Oregon, Colorado, and nationwide. With Vermont’s labeling law set to take effect in July, and with 92% of the American public supporting labeling, this is a time to get on the right side of history. Campbell’s Soup Company has pledged to label genetically engineered foods, and to support mandatory labeling in the United States. Tell Coke that fighting labeling is a losing battle, and it’s time to be a leader, not a loser. More than a quarter of a million people have joined us in urging Coke to stop fighting labeling initiatives, and to get on the side of consumers in supporting national, mandatory labeling for genetically engineered foods. It’s time for Coke to listen, and to stand up for what’s right. 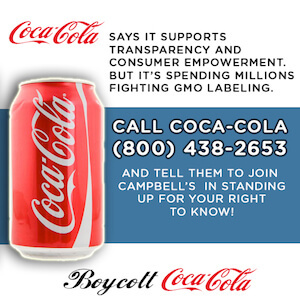 Join us in telling Coke we have a right to know what we’re eating and drinking! Let us know how your call went! If you’re on Facebook or Twitter, post on Coke’s Facebook page or Tweet them at @CocaCola. You say you support transparency and consumer empowerment. But you’ve been spending millions of dollars fighting labeling of genetically engineered foods. Please follow Campbell’s lead: label your GE products and support mandatory, on-package labeling of all GE foods. Coca Cola also owns Honest Tea – a brand that is already organic and non-GMO. Tell Honest Tea to urge its parent company to stand on the right side of history. Click here to go to their Facebook page. Honest Tea is owned by Coca Cola. And Coca-Cola is still fighting GMO labeling. Have you told your parent company to join Campbell’s and to support federal mandatory GMO labeling? You can also share and engage with our Facebook post below to help spread the word! Campbell’s Soup Company recently pledged to label genetically engineered (GE) foods, and to support mandatory labeling in the United States. I urge Coca-Cola to take the same leadership steps. The writing is on the wall: mandatory labeling of GE foods is only a matter of time, and companies like Campbell’s and Coca-Cola can either get on board or be left behind. Fighting labeling is a losing battle, and it’s time to be a leader, not a loser. Please stop trying to keep us in the dark about GMOs, and issue a public statement that Coca-Cola will label its GE products and support mandatory, on-package labeling of GE foods. Add your voice — sign the petition now! You’ll get Coke campaign action updates & complimentary membership in The Food Revolution Network & The Center for Food Safety. You can easily unsubscribe at any time. Coca-Cola has been spending millions of dollars fighting GMO labeling. But the company says it supports transparency and consumer empowerment. Now is the time to get on the right side of history, and stop fighting your right to know what you’re eating (and drinking)! In addition to its soft drinks, the company owns many brands marketed as healthier alternatives, including Honest Tea, Zico Coconut Water, Odwalla, Zico, Vitamin Water, Simply Orange, and Powerade. According to Bloomberg News, these Coca-Cola brands play an increasing role in the company’s profits. We have a unique opportunity to urge Coca-Cola to do the right thing. Join the movement by boycotting the Coca-Cola brands that are marketed as healthier alternatives until they pledge to cease any and all financial contributions to anti-GMO labeling efforts. Many companies, including Campbell’s Soup Company and Mars, Inc., have responded to consumer pressure and stopped giving money to fight GMO labeling. We are calling on Coca-Cola to join them, and want to urge everyone to help us make this happen. Join over 246,549 people and sign our petition at Change.org urging Coca-Cola to stop funding efforts to block the labeling of GMOs. When you sign the petition, an email will automatically be sent to several of the decision makers at Coca-Cola. Every signature, and every email makes an impact. Did you know Coca-Cola owns nearly 100 drink brands, including Honest Tea, Powerade, Odwalla, Zico, Vitamin Water and Simply Orange? We launched a Coke Boycott campaign on Buycott.com to make it easier for you to identify a Coca-Cola brand when you are shopping — and over 7,248 people have already joined our campaign and started identifying Coca-Cola products while shopping. Buycott.com also has a free iPhone and Android app so you can take our Coke Boycott with you wherever you are! If you are ever in doubt about whether Coca-Cola owns a beverage, it takes just a few seconds to find out! The Honest brand proudly doesn’t use GMOs in their products, and they have disclaimers throughout their website saying as much. Coca-Cola owns one brand that proudly uses no GMOs, but they have been caught funneling millions of dollars into fighting your right to know what’s in your food and beverages. Parents should know the facts about Honest Kids and Honest Tea. Profits from sale of this brand help parent company Coca-Cola to keep GMO labeling out of grocery stores. Their efforts are making it harder for parents to make smart choices for their children. Help us spread the truth about Coca-Cola, their Honest Kids brand, and their work to try to prevent GMO labeling. And give Coca-Cola some incentive to change their ways. Help us spread the word on Twitter by sending one or all of these pre-filled tweets, or by using our #CokeBoycott hashtag!